After a very interesting set of games at 1200 points during the most recent local tournament, it was time to get back to playing at 2000 points! This time, however, it was a game like no other as I had a unique chance to play against - Imperial Romans! During the tournament I talked to Glen, another great local player and he is known for bringing his beautifully painted Romans to the events. 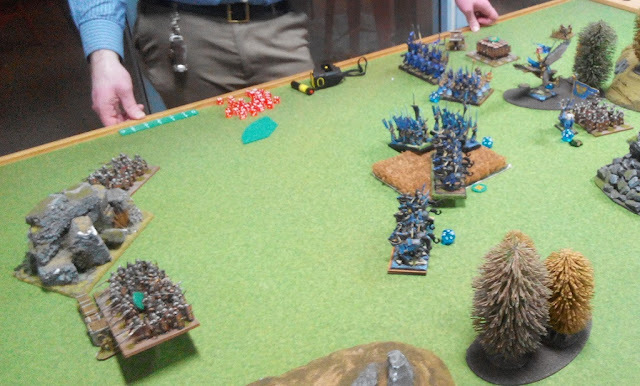 While terrain rules for KoW Historical are not in use, such armies are usually allowed. 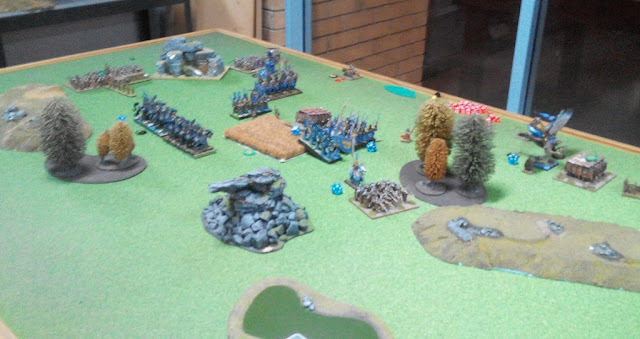 I would love to play a proper KoW Historical one day but this time we agreed I am going to bring my Elves as usual. Glen brought all infantry army with no less than 6 war engines! There are 200 models of Roman Legionnaires in this army alone not counting war engines and heroes! :) That is some dedication in painting for sure! Now, what that it all really means? 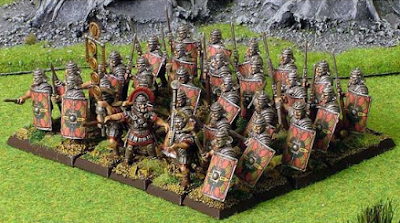 Legionnaires are in fact Warriors from the Master List in the KoW Historical supplement. It means they are all Speed 5, Melee 4+, Defense 4+, 12 Attacks per Regiment and 25 per Horde. In addition, they have 13/15 nerve per Regiment and 20/22 per Horde. Which is much easier to remember even if there are 8 units of them total! 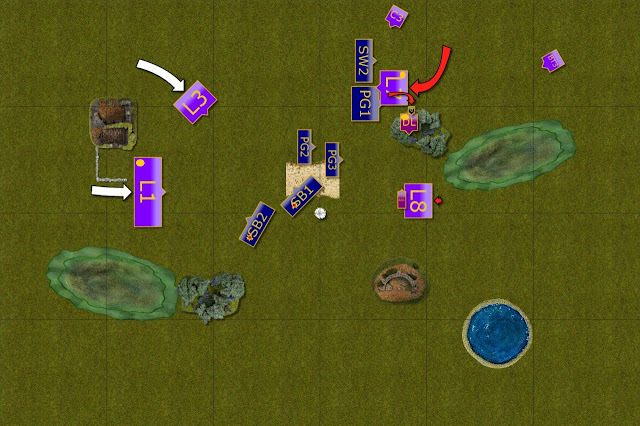 What is more, Foulkon(2) is actually a very useful rule as it makes the units much less vulnerable to shooting. It effectively means that all Warriors have equivalent of 6+ Defense. Once in a game, each of the units regardless of size, may use their pila as 10 attacks and throw them at the enemy using Range 5+. 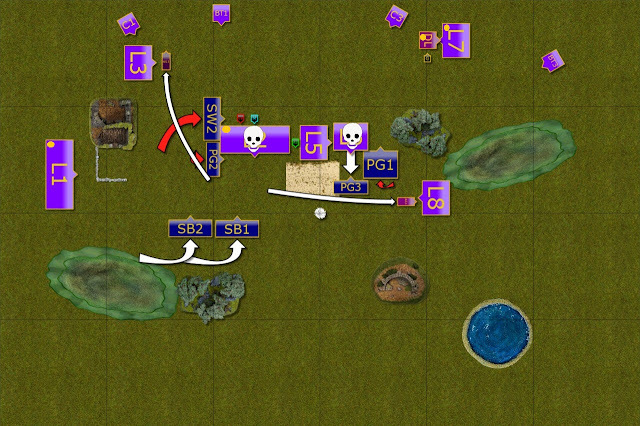 This army has a lot of units to hold objectives, cannot be easily damaged with shooting and with the help of Musician and Eagle Bearer who provide Rally(2) and three sources of Inspire (Army Standard) or Very Inspire (General and Eagle Bearer), these units may hold the line surprisingly well! However, to help the infantry to deal with the enemy there was entire train of war engines. Three catapults could really hurt. Even a single hit with one of them against any of my units may have potentially disastrous effects! Combined, they have a chance to eliminate even the most tough units. Smaller Bolt Throwers may not be as deadly but do not have minimum range and can also add to the damage, either against the same target or to spread the fire evenly. It can be even more dangerous if coordinated well with the throwing weapons from the infantry. 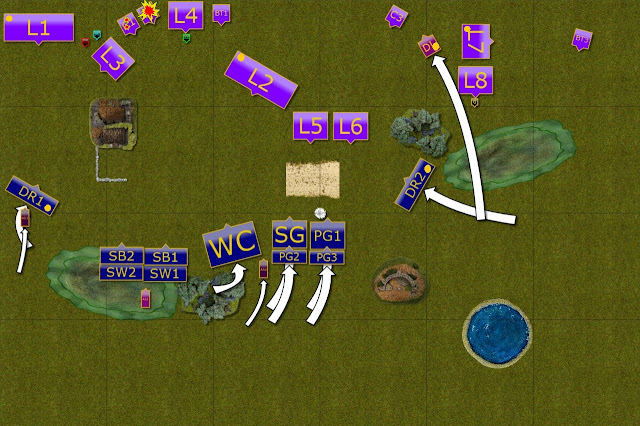 In general, I face the infantry based army that can hold the line from the frontal attacks very well and which is probably not going to be damaged at range. The exception would be War Engines and I decided I would try to use my own shooters to eliminate them if the opportunity presents itself. At the same time the enemy is slower and less maneuverable so I wanted to use that to the advantage. I would need to isolate and overwhelm these units one by one and avoid situations where I would have to fight the war of attrition. We rolled Eliminate as a scenario and it was the second time I played it. It puts specific pressure on me because my most maneuverable units, Drakon Riders, are more valuable than usual and I may be hesitant to risk them. 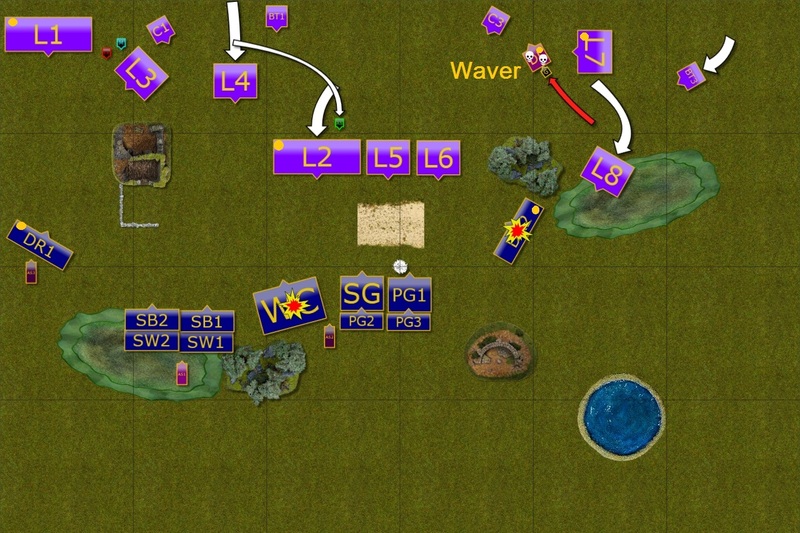 I indicated central counter with the white circle and units that carry the bounty have yellow markers. In the case of Romans, they were carried by both Hordes and one Regiment (L7). I decided to deploy on one flank as due to large number of melee infantry I could not fight these in one-on-one combats. I deployed in the refused flank formation in hope to be able to maneuver properly and to destroy the center before the flanks could envelop my army. I also wanted to use my shooters to aim at more vulnerable war engines and at least limit their impact on the battle. I won the roll off and took the first turn! Elves advanced against strange looking humans. They kept the distance to avoid being shot at with the reported throwing weapons. 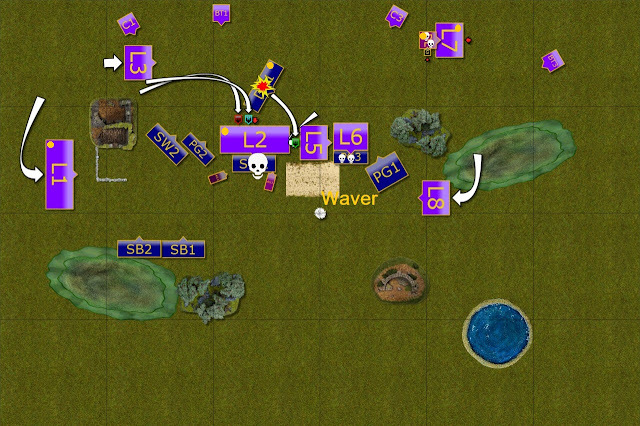 The fast cavalry aimed at the catapult and managed to waver the crew while lucky shots from advancing Sea Guard eliminated one of the Bolt Throwers. 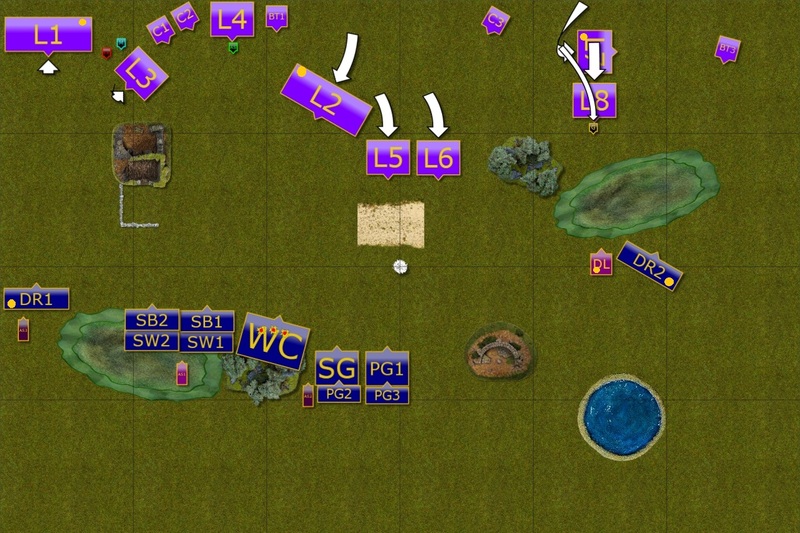 Romans advance in the center. 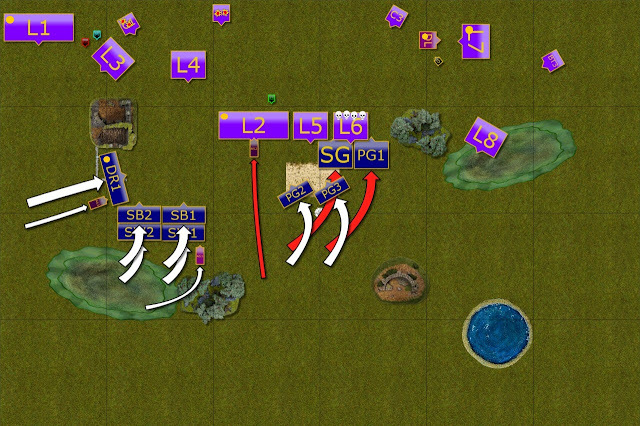 Romans advanced in the center but held their units on the flanks. 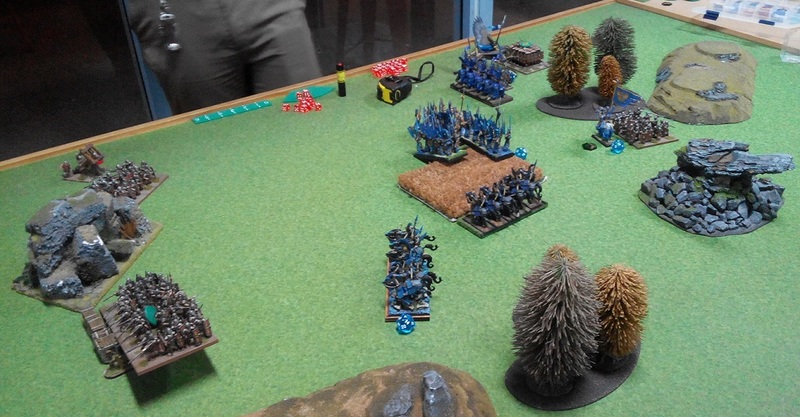 On the West the units even pulled back a little to avoid early charges of the Drakon Riders. On the East the units maneuvered to intercept the enemy fliers too. Elves continued their advance and kept shooting at the enemy. 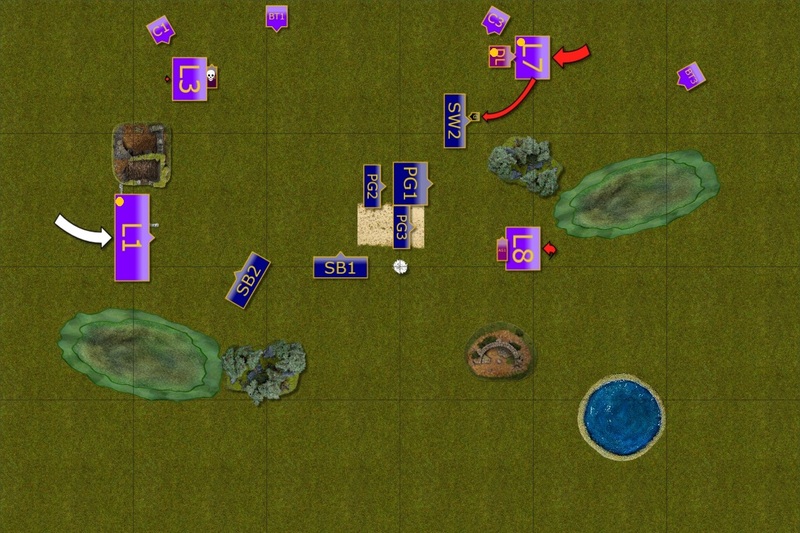 Fast cavalry succeeded in destroying the first catapult. On the left flank the Drakon Riders kept maneuvering cautiously but on the right flank their companions suddenly changed the direction to threaten enemy flank. Only the Lord sped towards another War Engine. But was it a wise decision? Romans used the opportunity to gain the advantage as the enemy overextended in its advance towards the war engines. 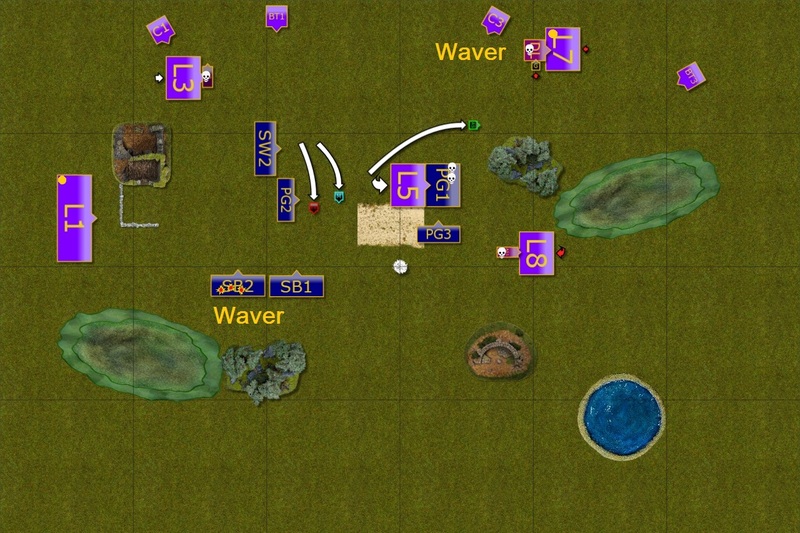 First, the General attacked the foe and two commanders engaged in single combat. Then the war chariots were crushed by the incoming boulders and bolts. Then Legionnaires threw their pila at the enemy flying cavalry and the few that hurt did it so badly that enemy drakon riders were routed! The first wave is held back. The first wave of the attacks was held back by the Romans and even the Elven shooting was not effective as always. 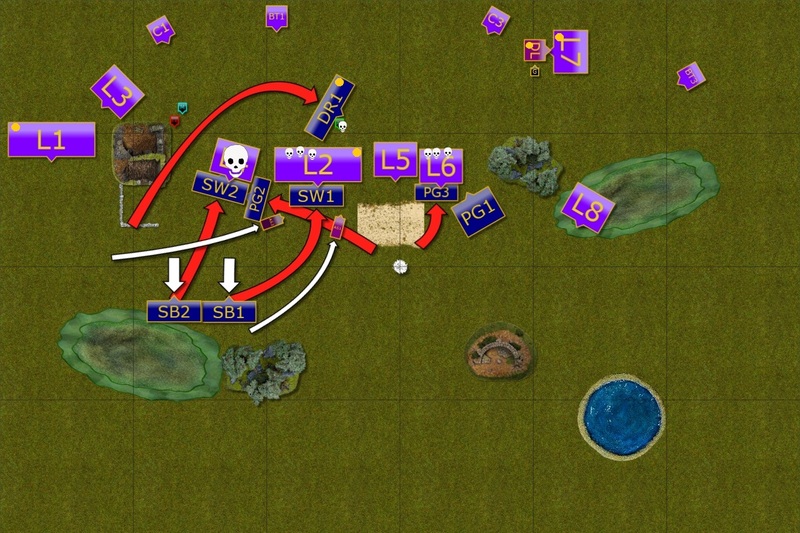 Elves had to push hard and fast now once the flanks were abandoned in order to break through the middle and to avoid encirclement. It was time for Romans to strike back. First, two maniples of the Legionnaires attacked Sea Guard and Elven marines were routed. 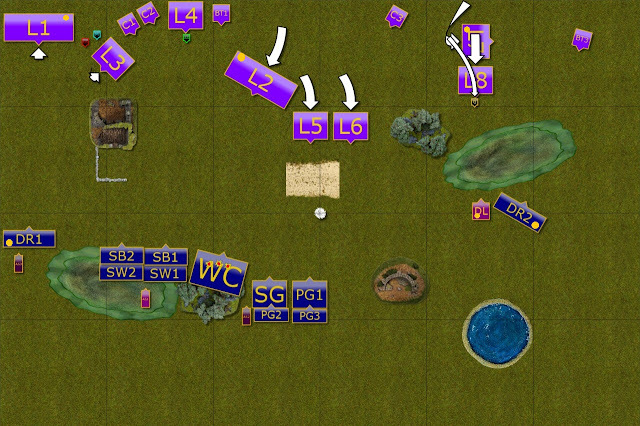 Then the other units were moving forward and around the flanks to keep enemy in place and outflank them. Last but not least the artillery wavered Palace Guard regiment to further add to the confusion among the enemy ranks. First crack in the Roman defense. One unit down but the plan didn't work as expected. The situation was becoming difficult for the Elven forces and they needed an opening to exploit. Fortunately for them such opening was presented. One of the Roman units moved a bit too forward and Palace Guard, together with Storm Wind cavalry routed it on the charge. That allowed them to outflank the enemy. At the same time second unit of heavy cavalry tied the horde of enemy warriors so that the Drakons Riders could deal with the enemy Army Standard and aid them with timely rear charge. Unfortunately, brave Army Standard held his ground and the attack faltered. Romans counter attacked and destroyed one unit of heavy cavalry. 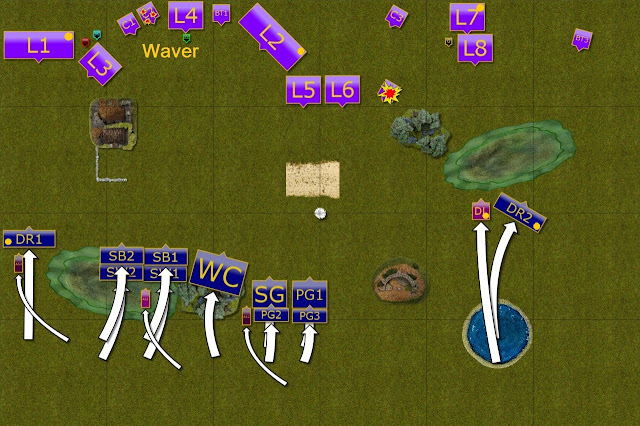 The Place Guard got wavered and other units were closing in on the flanks. In addition, Drakon Riders were also shot down from the skies before they could continue their charge against vulnerable rear of the formation. Elves claim some important victories. Once again Elves needed an opening and once again Romans did not prevent that from happening. 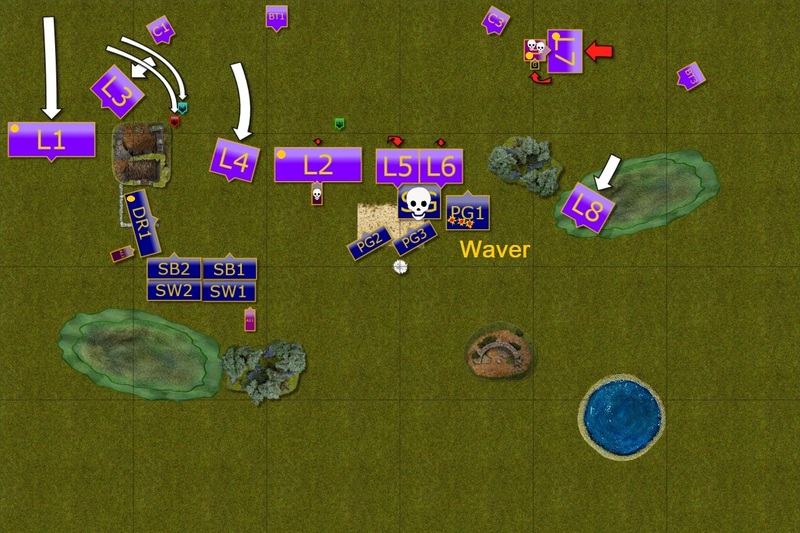 The horde of warriors left the flank open and two units of the enemy could exploit that mistake. The charge was devastating and the huge unit was routed and the bounty was claimed! 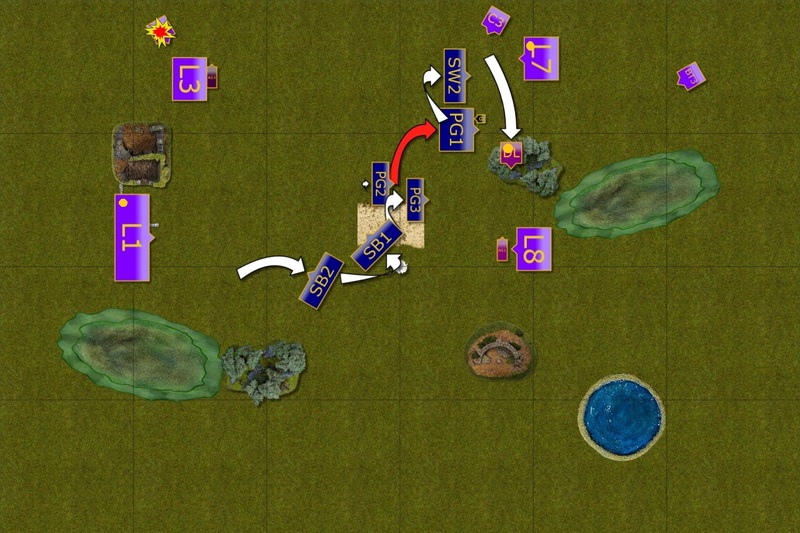 Fortunately for the Palace Guard there was still a chance to charge damaged enemy unit and it looked like Elves were slowly winning the fight for the center. But would other units hold long enough to keep it? Romans were running out of time and their slower infantry was still too far to attack. 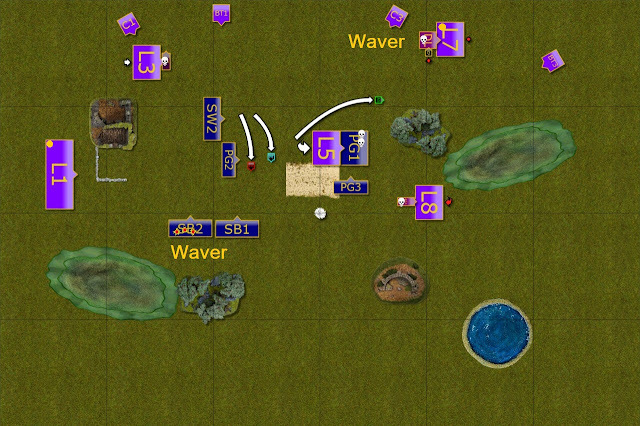 To make things worse, Elven Heroes held their ground too and Romans could not capitalize on winning the flanks. With enemy too far to help or blocked, the units in the center doubled their efforts. 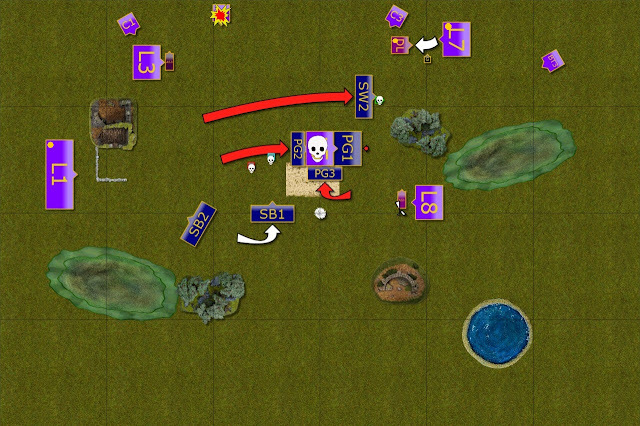 Palace Guard managed to rout two enemy heroes and join the rest of the infantry in a combined attack against single enemy units still threatening the center. As Storm Wind cavalry also captured enemy Eagle the surrounded unit didn't hold either. Romans kept attacking as while the center seemed to be lost, then the victory was still possible. One way of achieving that was to kill enemy commander but despite many wounds he kept fighting! Drakon Lord tries to escape. One more war engine down. As the enemy general was now occupied with fighting for his own life, Drakon Lord moved away from combat and avoided enemy infantry. Unfortunately, the Palace Guard failed to capture the enemy general and it was now time for his revenge. Despite their efforts, Romans are defeated - just! Romans had two chances to swing the battle into their favor. First, they shot at the Silver Breeze cavalry that was defending the center of the battle field. If they were routed then the middle would have been lost for Elves. Unfortunately for Romans, the cavalry held - barely. Second chance was for the Roman General to win the battle by himself. He attacked Elven Drakon Lord but despite wound being inflicted, the enemy commander once again showed his resolve and didn't yield! Many thanks to Glen for a fantastic game! Romans did great and I was extremely lucky not to lose it with the last dice roll. If the nerve check for the Drakon Lord went in Glen's favor, that would have been his victory! I did not avoid mistakes and they were really crucial. First, not bringing the Army Standard close enough to Drakon Riders knowing that they will be shot at was bad. It does not matter that double 6's were needed to rout the unit. That is precisely why Army Standards are included! I also overlooked enemy General and his attack grounded my Drakon Lord for the entire battle! That he survived at all was purely due to less than average rolls for Glen. I didn't even have any units to help. What allowed me to come back and secure a small victory in the end was the fact that Glen didn't spot that he is offering flank charges that claimed his units in the center. In addition, I think that there was no need for his second horde to move back at all. If Glen moved that unit forward it would have put more pressure on me and would have been in place to charge my units in the center too. It was really enjoyable game and I am looking forward to a rematch already! This is the first report I’ve read that had a historical army and it sounded like a fun list to play and play against. I must admit that has me interested in possibly looking into playing historical myself. I love the games that come down to a few crucial dice rolls, those are some of the most memorable. Great job on using your units’ small footprint to get into the flanks. Definitely showing the upside of an MSU force. It is interesting that you mention it but one of my weakest areas as a player is making sure my inspiring is where I need it. It doesn’t help that I rely on less inspiring than you! I often find myself not anticipating where the critical area for them is, or being out of position to where a double move could get me there but I’d lose the banechant. Definitely something for me to improve on. I’m hoping to finish my herd list this month as I’ve been blessed with time off from work for a few days in a row. I’ll take pictures when complete to show them off to you! I am very tempted to try KoW Historical with both armies from the same period and full set of rules for that game. It will be very interesting for sure! Looking forward to seeing the pictures of the new army whenever you have them! How do you find the chariots worknfor you and how do u deal with massive armies like rats orc and goblins? I was thinking to try more melee msu instead of ahooting as it doesnt seem to work well. I like the chariots because they are very flexible, especially with Pathfinder upgrade. They are not a huge threat on their own and it seems that people are a bit confused how to treat them. Because of that the opponents may be a bit more cautious in the approach which is a good thing for me. 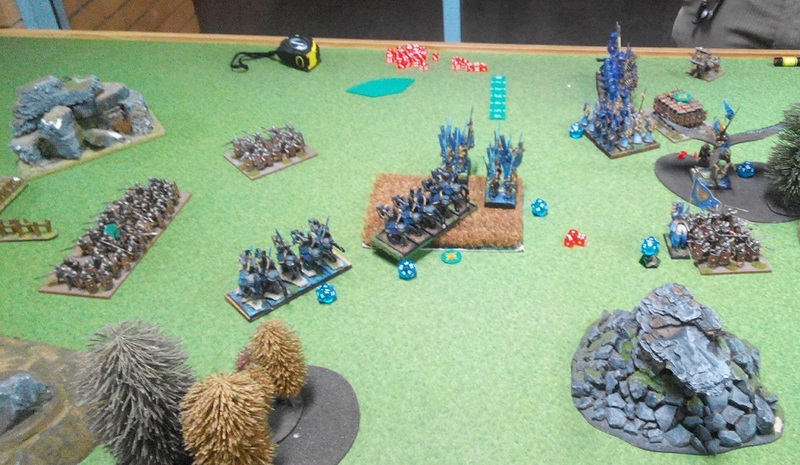 The fact they are large cavalry allows me to see more targets and add these few more dice to either shooting or melee. It is always about focusing fire and combined attacks. However, chariots do great as blockers because they have bigger base and with H3 they may prevent units from attacking other elements of your army. So I often send them to take one for the team and charge some tightly packed enemies. 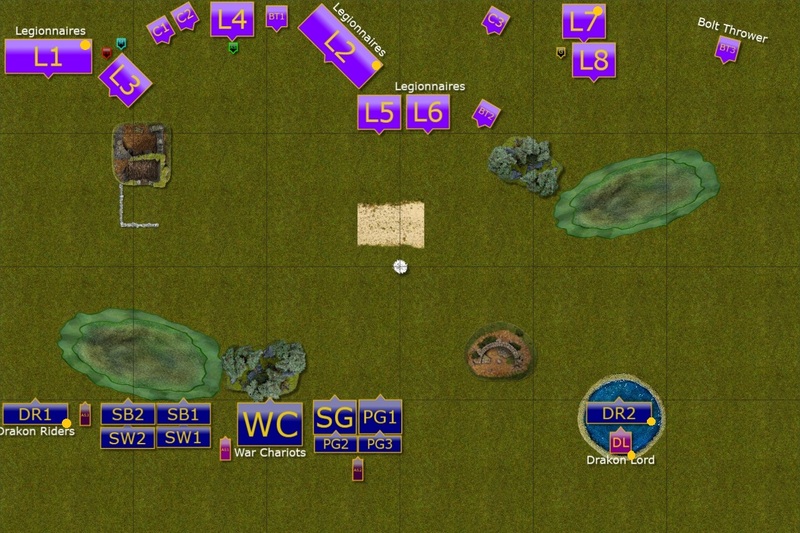 They cannot rout them but will buy one more turn which may be crucial for winning the scenario. My last game against Undead in the most recent tournament is a good example. I haven't had a chance to play against Goblins or Rats really. I had one game against Goblins at 2500 long time ago but that was early so I really made a lot of mistakes and we didn't play full 6 turns either. I lost against Rats and they will always be a challenge but I believe I can eventually come up with some ideas how to fight them with more games and experience. 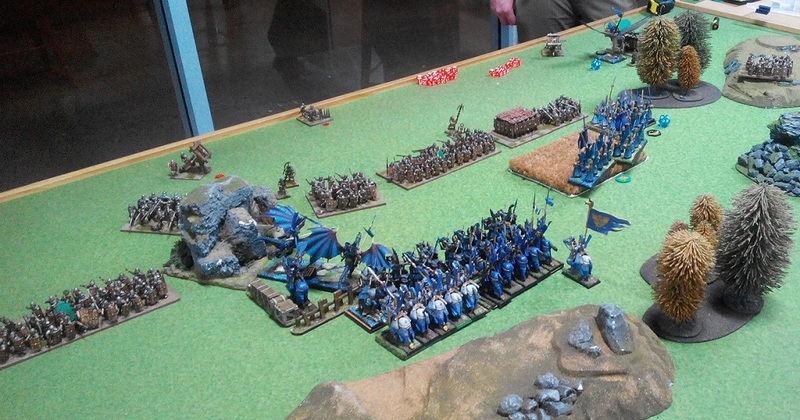 In fact, there are 2 armies, one Goblins with lots of Maw Beasts and Trolls and Rats that are going to be played at the next tournament I am attending so I may have a chance to learn again soon! Personally, I prefer to have combined arms approach so that I can do something in all phases of the game. I also found that people may be over cautious when shooting is present so that it gives more time for maneuvering. Good stuff. I'm looking forward to seeing more.